Falkland Kitchen Farm is a 5 acre organic market garden nestled at the base of the Lomond Hills in Fife. We grow over 70 varieties of fruit, veg and herbs which we sell to local retailers, restaurants and through our veg box scheme. We believe that small scale farming has huge potential to produce fresh and healthy food whilst also enriching our natural environment. Learn more about how we grow! The farm was started by Bryde and Nat, a young couple with an adventurous spirit and a commitment to contribute to a fairer, healthier and more vibrant food system. Bryde and Nat have always been passionate about food and spent most of their time together cooking and dreaming about one day running a farm! Little did they know that dream would become a reality and they would move from a flat which was quickly becoming a jungle of seedlings to a field of barley which was to be their blank canvas! 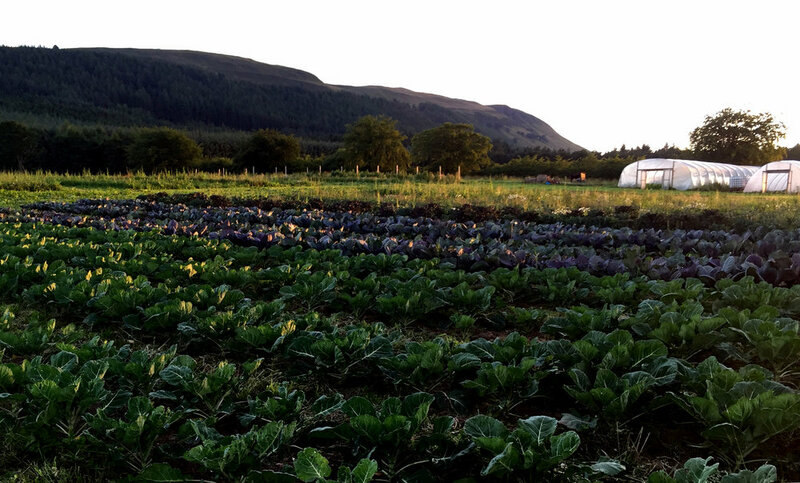 The opportunity arose when the Falkland Estate launched an innovative scheme to encourage new entrants into organic farming by offering one of their fields to rent. After a year of planning and preparing for the steep learning curve that was to come, Bryde and Nat signed a lease and built their first polytunnel in June 2014. The farm is now in its 4th growing season and has gone from strength to strength. The field is home to a increasing number of birds, bees and other native wildlife, the soil is getting better year on year and every week we pack the van full to the brim with veg for our local community. Nat is a grower and chef. For him food is all about how it connects us to the natural environment. There is nothing that he enjoys more than harvesting a crate of veg from the field and cooking it up over the fire! Before starting the farm Nat studied Philosophy at The University of St Andrews and wrote his dissertation on Environmental Ethics with a focus on Deep Ecology. This cemented his ambition to pursue a career which would put his environmental principles into practice. In 2017 Nat won Le Cordon Bleu London’s UK Scholarship Award, and has since achieved his 'Grand Diplome' in Cuisine and Patisserie. Nat plans to use this experience to showcase the farm's produce and inspire others to grow and cook! Bryde has a deep passion for horticulture and when she's not busy planting kale she loves exploring innovative growing techniques and the amazing diversity of edible plant life. Bryde takes inspiration from small farmers, plant breeders and botanical explorers all over the world and tries to source new varieties for the farm and implement the best growing practices. Before starting the farm she studied Philosophy and Art History at The University of St Andrews. She is currently studying towards her RHS Level 3 Diploma in the Principles and Practices of Horticulture. Bryde also loves sharing her experience of starting Falkland Kitchen Farm. She enjoys having the opportunity to teach the local community about growing food through running Local Food Works courses, speaking at local schools and conferences and managing a training programme for new entrants to organic farming at Stepney City Farm. Neill joined the farm in 2017 and has been keeping us laughing ever since! He is a passionate believer in organics and completed the Soil Association's Future Growers course in 2014. Neill then went on to work at various organic farms including Bristol Community Farm and Pillars of Hercules. His favourite plant to grow is nasturtium ( and he even has a tattoo to prove it!). Poppy and Dusty are our much loved farm dogs! We can't say that they get an awful lot of work done.... but one day we will finally crack teaching them how to dig up docks!